X-LOFT - New lofts in Liben. Ecological and economical living in Prague’s center. Longing for a bright, spacious flat in a timeless design near Prague’s center? Project X- LOFT offers it all, and more! Choose an atypically-designed loft, spacious maisonnette, or garden flat for a very reasonable price. We will be glad to prepare an interior design for you from our diverse collection, at no charge. Project X-LOFT’s unique location boasts a wide range of sporting possibilities. Tennis, badminton, volleyball, football and even golf are all close by. For nature lovers there are cycle paths, parks and the Vltava River. By using high-quality materials, a heated façade, triple glass panes, solar panels and heat conservation, your operating costs can be reduced by as much as 70%. 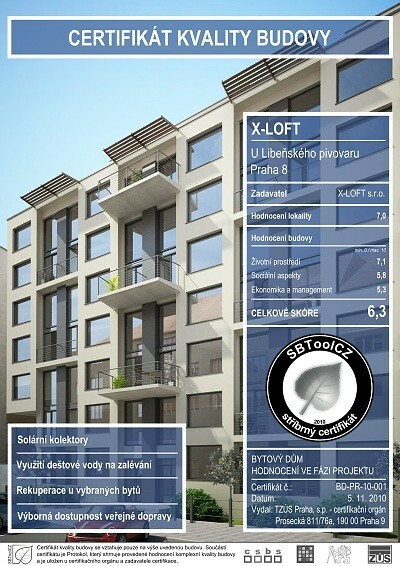 Low energy usage X- LOFT received the silver certificate SBToolCZ, guaranteeing the quality of the construction in terms of sustainability. 2 minutes to the tram, 5 minutes to the metro, 10 minutes to the City Centre. Project X-LOFT shows its strengths with its complex civic amenities and easy transport availability. A wide range of shops and services, a shopping centre, schools and government offices are all nearby.